Once there is insufficient tooth structure to hold your extra large sized filling, or if a part of your tooth fractures, a porcelain crown is recommended. Crowns are also known as "caps". 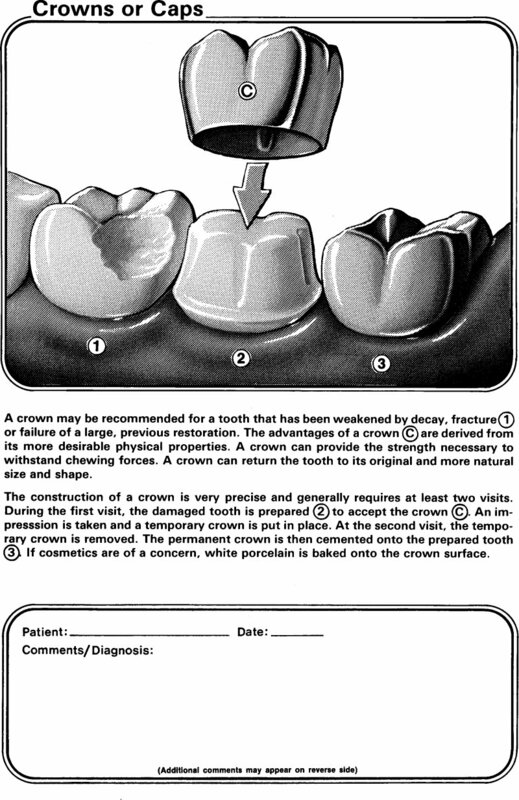 Crowns are a type of dental restoration which, when cemented into place, fully cover your tooth. In comparison, fillings are restorations that fill in or cover over just a portion of your tooth. A crown is a restoration that covers your entire tooth and effectively transfers the forces of chewing on to your root. Crowns encase the entire visible aspect of your tooth, and become your tooth's much stronger and more cosmetic outer surface. It used to be that any crown had to have some metal substructure for strength. That tremendously strong metal substructure sometimes showed as a little gray line when smiling, right at the gumline. That minor cosmetic detraction has been resolved! Today, crowns can be made completely of porcelain. The all-porcelain crown can look very esthetic and very natural. Dr. Meyer recommends all-porcelain crowns for your front teeth, but has found that all-porcelain crowns on back teeth are more likely to fracture. Porcelain crowns with a metal substructure are still recommended for back teeth.